What investors in the heavy-equipment manufacturer need to know as 2016 approaches. Given Caterpillar's (NYSE:CAT) exposure to beaten-down sectors like mining and energy, it's no surprise that it's one of the worst-performing Dow stocks of the year. In fact, Caterpillar is also among the bigger losers in the heavy-machinery industry, having underperformed peers like Deere (NYSE:DE) and Manitowoc (NYSE:MTW). While Manitowoc gave up most of its gains during the latter half of 2015, as plunging oil prices hit demand for off-highway equipment, Deere escaped the brunt of the pain as it's primarily an agriculture-equipment company, and farm commodities have held up stronger than metals and oil. CAT, DE, MTW data by YCharts. Given Caterpillar's precipitous fall during the past couple of years, the big question in investors' minds right now is whether the approaching year will provide some respite. Will 2016 be a turnaround year for Caterpillar, and will its stock regain some of its lost glory? Get some insight in the slideshow below. 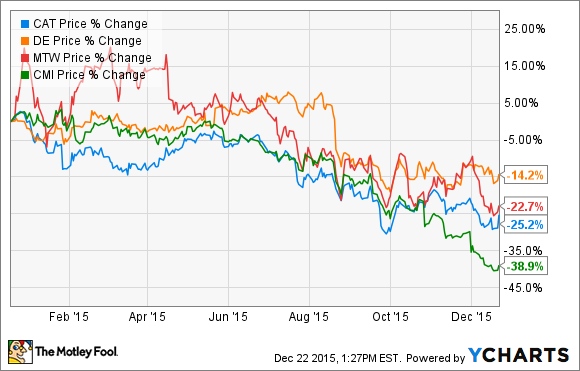 Will Caterpillar Stock Recoup This Year's Losses in 2016? from The Motley Fool.